As MUTEK founder and director Alain Mongeau explained in his speech before Friday's (August 24) A/Visions segment, Russian light art collective Tundra have wanted to play the festival for some time now. Unfortunately, working mostly with installations rather than live performances, this has been an impossibility in the past. 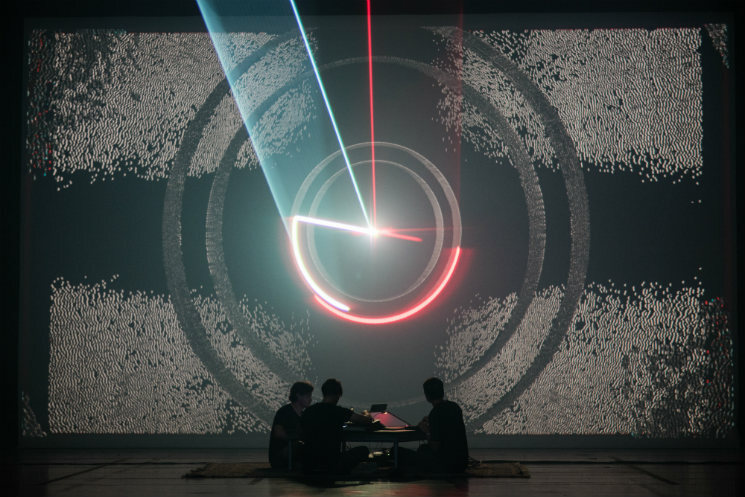 So, in order to make the bill, Tundra created a show specifically so that they could come to MUTEK, which speaks volumes to the draw that the festival has managed to cultivate over the years. The show, titled "NOMAD," actually made its world premiere here, making it even more special. Not that it needed any help in that department — this truly was something to behold. The three performers sat cross-legged on a low table in front of a gargantuan screen, leaving as much room as possible for everyone to see what was behind them. Backed by live music that sounded like a mix between Kiln's later material and the early work of Bola, the trio displayed some of the most idiosyncratic visuals I've ever seen. Wild patterns filled the stage before a perfect circle formed in the middle, with a precise laser jutting back and forth between its boundaries. Not to take away from the majesty of it, but it looked a wristwatch that one of the Cylons from Battlestar Galactica would wear — if they ever need to know the time that is. After that, tight beams of light started to make peculiar shapes atop the blurry background: if you've ever seen laser etching being done on sheets of metal, this is exactly what it looked like. As if we weren't visually stimulated enough, they went on make a deluge of bright orange comets rain down, before ending the show with an uncountable number of laser point stars projected onto the dark screen. We've done our best here to capture the performance, but "NOMAD" is really something that you need to experience for yourself. Travel a great distance if you have to — it'll be worth the trek.